Halloween is on Tuesday, so let’s celebrate with a chocolatey treat, shall we? I’ve been testing a LOT of nut-free sweet treats lately – some successful, and some very much not! The reason behind it all is that one of my lunch customers at work has a severe nut allergy, and she can’t eat sunflower seeds either so sunflower butter (a very common alternative in sweet recipes) is out. She’s totally fine with coconut though, so there’s been an abundance of coconutty delights coming out of my kitchen – specifically, my food processor. And you know what? 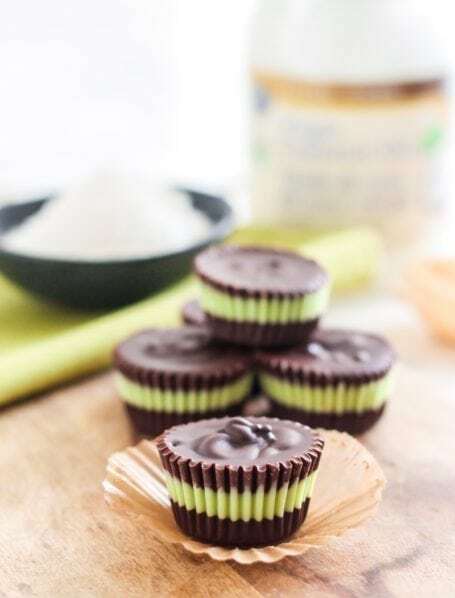 While these Pumpkin Spice Almond Butter Cups were a hit amongst my friends who enjoyed them, the nut-free, 6-Ingredient Matcha Mint Dark Chocolate Cups I’ve got for you today have been raved about and requested even more. 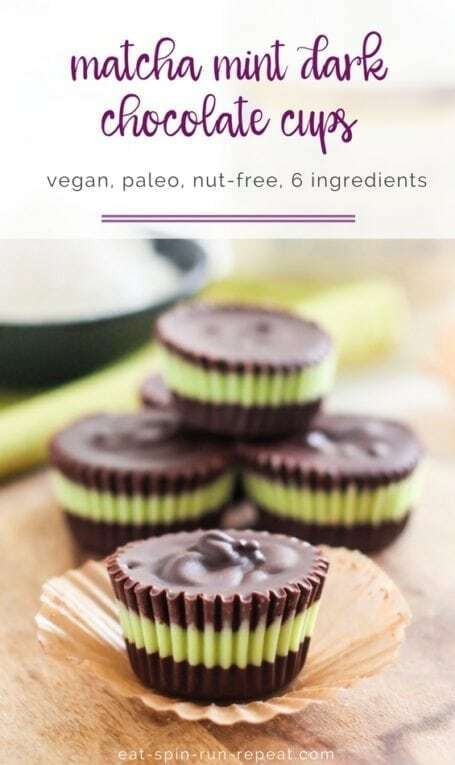 Annnnnnd… what’s even better (or at least the nutrition nerd in me thinks so), is that they’re actually really good for you! It’s a well-known fact amongst nut and seed butter fans that quality organic nut/seed butters cost a pretty penny. If you have the time, it’s super easy to make a batch of your own at home, but did you know it’s just as easy to make coconut butter too? You literally just need to blend dried unsweetened shredded coconut in a food processor. About 10 minutes is all it takes, and BAM. You’ve got a gorgeous, liquidy, coconutty butter that’s great for anything from drizzling on roasted sweet potatoes (add cinnamon too – that’s my fave snack! ), spreading on pancakes, or drizzling on top of cold things like vegan ice cream to make a shell-like coating that firms up in seconds. 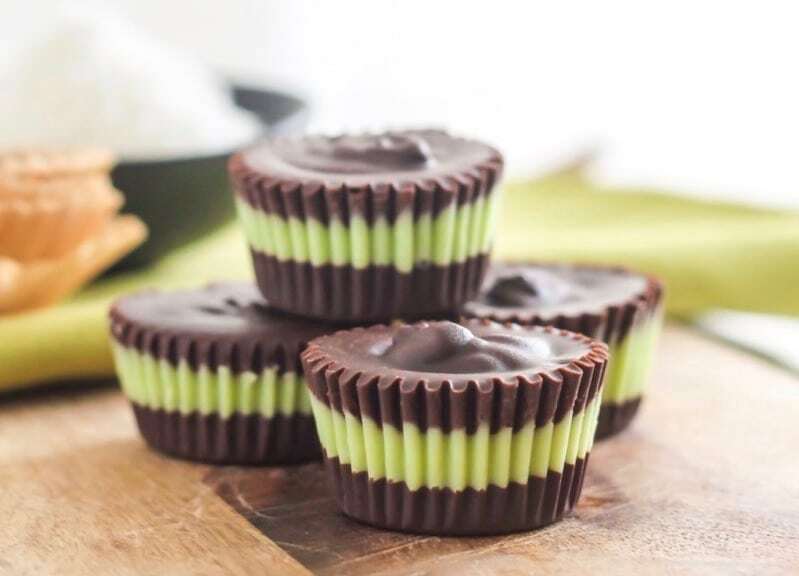 Orrrrrr….. you can mix it with matcha and peppermint to make chocolate cups, like these ones. Miraculously these worked out on the first try. 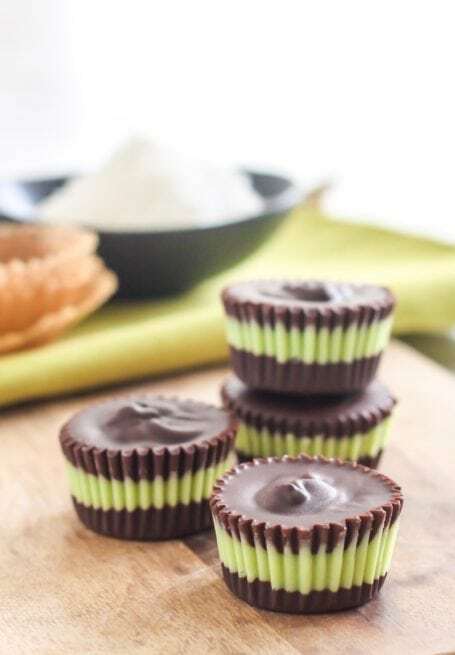 I made them one afternoon and waited until the next day to remove the paper cups from each one, but that night I had the worst nightmare that when I tried to peel them off, they wouldn’t separate from the chocolate. As you can imagine, I woke up in a panic, ran to the fridge and pulled out my mini muffin tin to see if my nightmare was actually going to come true. Much to my amazement (and immense relief), the papers came off without any peeling whatsoever. Kitchen win! While you can totally leave the middle layer as coconut butter (which would still taste fabulous by the way – I was 100% licking my food processor clean), matcha seemed like the perfect superfood to 1) match the minty flavour of peppermint extract, and 2) take the antioxidant profile up even higher. 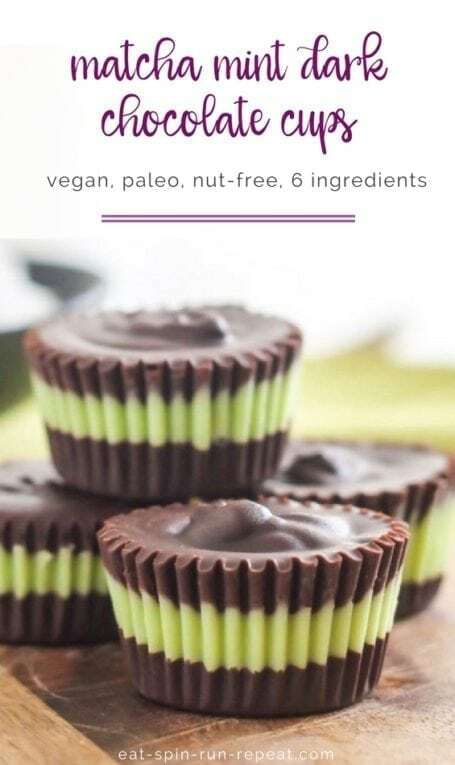 When you consider that there’s also maca (one of my fave adaptogenic ingredients that you can learn more about here) in the dark chocolate to help support the adrenals and thyroid, I think we can agree that these will probably be the healthiest chocolate cups you’ve ever eaten! 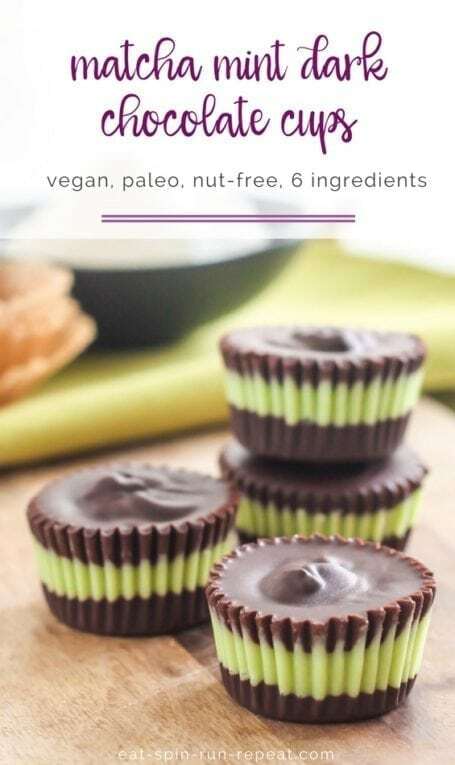 Nut-free and vegan-friendly, these Matcha Mint Dark Chocolate Cups are loaded with antioxidants, vitamins and minerals to help boost mood and reduce stress. It’s guiltless, superfood-packed dessert at its finest! 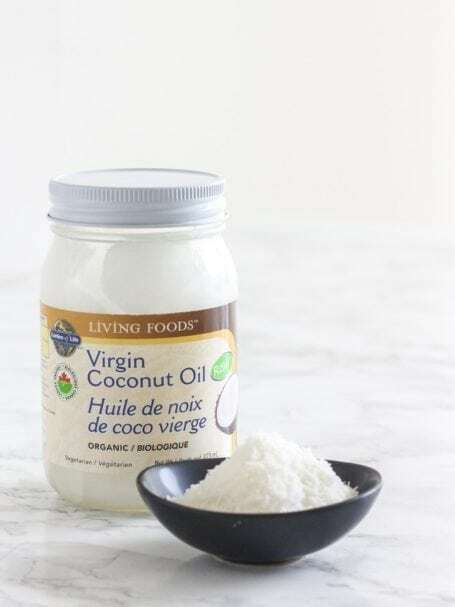 Make the coconut butter filling: Put half of the coconut in a food processor and mix for about 10 to 15 minutes or until it turns into a liquid – and it will! (I like to do this in 2 batches of 1 cup each because it seems to liquefy more quickly this way.) Pause occasionally to scrape down the sides of the processor jug with a spatula. Add the coconut oil (which will help to make it more liquidy-y), matcha, peppermint extract and stevia to the coconut butter and process again until evenly combined. Transfer the mixture to a small bowl. Line 16 mini muffin cavities with liners of choice. 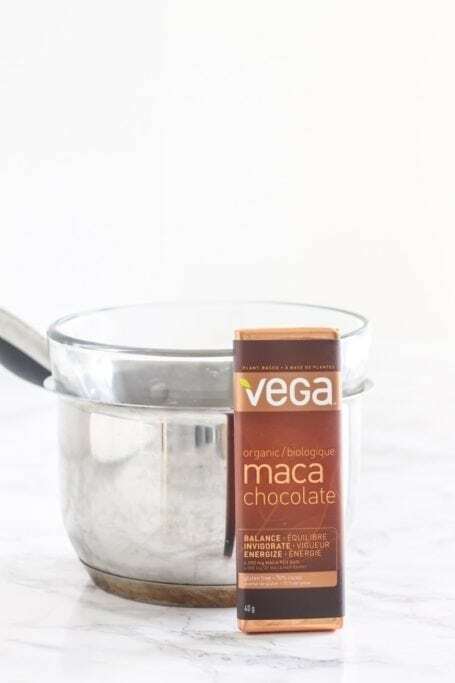 Create a double boiler to melt the chocolate: Bring a small saucepan about 1/4 full of water to a boil, then reduce heat to low. Place a larger bowl on top so that the bottom hovers above the water line. Melt half of the chocolate in the double boiler. Pour it into the lined muffin cups, filling each to about 1/3 of their capacity. Put the muffin pan in the freezer for ~10 minutes while the chocolate sets. 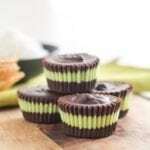 Once firm, add the mint matcha filling on top of the bottom chocolate layer, again, filling the cups by another 1/3. Freeze for ~10 mins or until firm. Melt the remaining chocolate in the double boiler. Divide it between the muffin cups, filling each very nearly to the top. Freeze for ~20-30 mins. I don’t recommend doing this in a blender because lots of the coconut will get stuck under the blades. It also tends to fly around the jug a lot, and you’ll be there forever trying to scrape down the sides. The most important thing about a double boiler: Don’t let the water into your chocolate melting bowl! 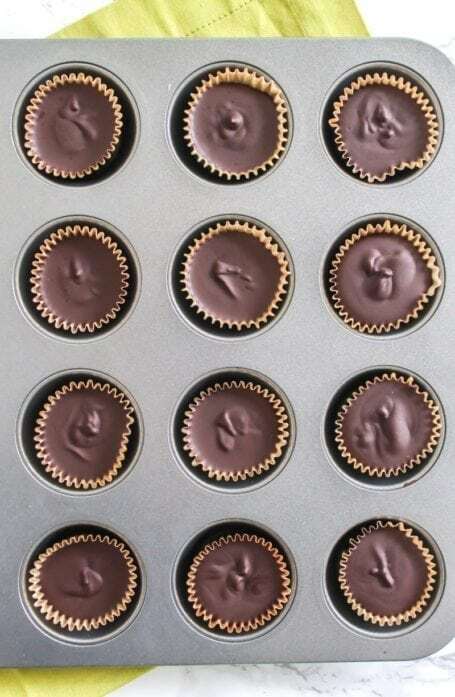 You only need a bit of water in the pot to create the steam that rises and melts the chocolate, and as soon as the water boils, you can reduce the heat. The steam will stay trapped under the bowl. I use a glass bowl as my double boiler, but note that they get hot so be careful when lifting it off at the end. Yummy yum! These are very delicious….made them tonight for dessert! What can I use besides coconut? Hi Abby! The coconut is what allows the matcha layer to harden properly, but personally I don’t think it has a strong coconutty taste by the time you get the peppermint extract in there. Is it the taste you don’t love, or do you want to avoid the coconut due to an allergy? 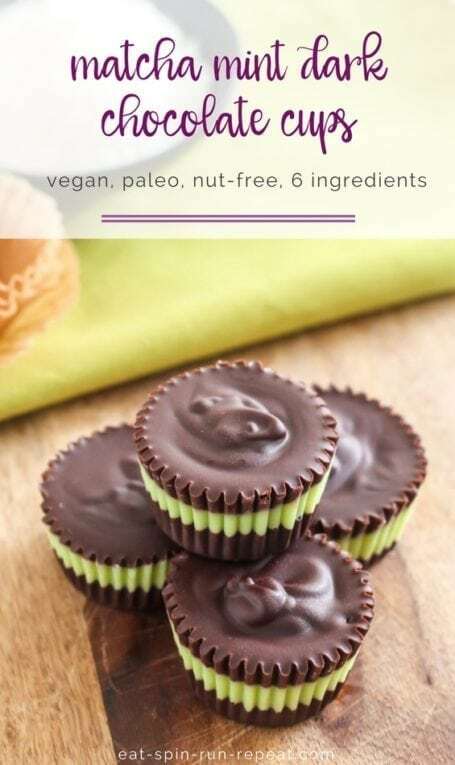 If it’s an allergy, you could also try doing a middle layer made of soaked cashews, sweetened with maple syrup, and with a bit of matcha mixed in for colour. This would be similar to the way a lot of vegan slices and ‘cheeze’cakes are made. Does that help?